We’re continuing our conversation with Basat Khalifa, president of DuraFast Label Company, about the Afinia L501 color label printer with Duo Ink Technology to find out how the L501 compares to the Primera LX1000. Q: Last time we spoke, you told us how the Afinia L501 compares to the Primera LX2000. What about the LX1000? How is it different? A: First, the Primera LX1000 and LX2000 are nearly identical. However, the Primera LX1000 lacks the pizza wheel style cutter of the LX2000 and prints a tad slower. It also does not have a wired or wireless Ethernet connection. Thus, many of the advantages of the Afinia L501 will be similar to those discussed earlier. Q: What would you say is the biggest advantage of choosing the Afinia L501 over the Primera LX1000 would be? A: Versatility for sure. The Primera LX1000 is a pigment inkjet color label printer whereas the Afinia L501 can use pigment-based inks or dye-based inks, depending on the desired application. If you had the Primera LX1000, you could certainly print durable GHS labels with it. After all, that’s what it’s built for. However, you would need a second label printer to print “prime” labels like wine bottle labels or coffee labels. Q: Do people really need to print both types of labels? A: Absolutely. Small manufacturing businesses are an excellent example. They manufacture goods that need product labels and packaging, right? These labels absolutely need to appeal to consumers. The vibrant dye-based inks and high resolution capabilities of the Afinia L501 make it a capable prime label printer. At the same time, these businesses need durable industrial labels for all kinds of purposes including shipping labels, carton box labels, inventory tags, barcodes, outdoor labels, and more. Some are subject to chemical labeling requirements and need to print GHS chemical labels. By having the Afinia L501 with Duo Ink Technology, these businesses can swap out the print heads and ink cartridges and print either prime or industrial labels as needed — and without the added expense of a second label printer. Q: How do the Primera LX1000 / LX2000 and Afinia L501 compare in terms of ink costs? A: The Primera LX1000 has the same ink cost per label as the LX2000, since they use the same HP pigment inks and print heads. So, as I discussed in my earlier article, the L501 offers a lower ink cost per label. The LX1000 was only introduced to offer a lower price printer to the market and once purchased, the customer is locked into the Primera LX2000 ink for the life of the printer. Printer manufacturers generally offer lower prices on the printer in order to generate higher earnings on ink sales afterward. The Primera LX1000 uses four individual ink cartridges. The Afinia L501 does the same and its ink costs are even lower. In fact, the Afinia L501 offers you a lower ink cost but also allows you to switch between pigment and dye inks as needed. Remember, over the course of a year, ink costs can cost even more than the printer itself. We highly recommend paying close attention to this important consideration and we will even do a free cost analysis on all the different printers a customer is considering buying to give them a more realistic idea as to the true cost of each label printer. Q: What about label size, quality and print speed? How do these two label printers compare? A: Since both these printers use the same HP print engine, the print quality is very similar. The LX1000 can print 8.25-inch-wide labels where L501 can print 8.5-inch-wide labels. Both produce excellent print quality. The LX1000 has the higher print resolution at 4800dpi while the Afinia comes in at a respectable 2400dpi. However, when you look at the printers’ labels, they will look very similar. The Afinia L501 uses a newer version of HP’s thermal inkjet technology, too. Q: The best bang for the buck would be…? 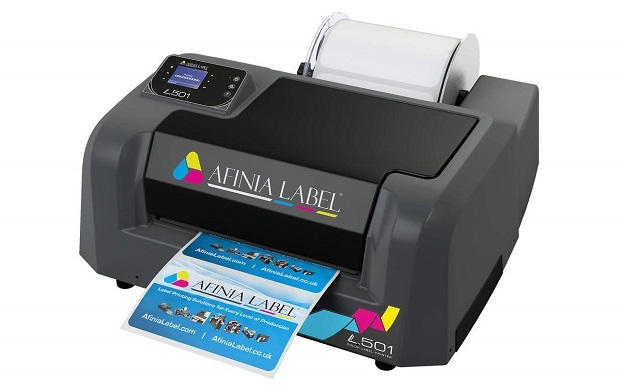 A: Between these two label printers, the Afinia L501 for sure! It does an incredible job, saves money on ink, and eliminates the need to buy a second color label printer for prime labels.